Superheroes are ubiquitous. Where in the seventies it was cop shows, the eighties action shows, the nineties police and legal procedurals, since the success of Bryan Singer’s X-Men in 2000 the floodgates have opened what was once a niche market to the flood of mainstream acceptance with both Marvel and DC building extended universes across cinema and television. Hero worship is in. And it’s easy to see why. 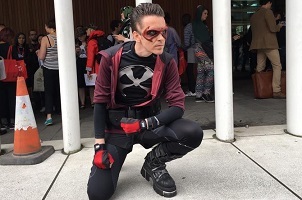 Bold, dynamic, unflinching, with cool costumes – sometimes even capes – even when conflicted they agonise over their decision with the brooding chic of a hero. Their every action by extension echoes across the world, every kitten saved from a tree a metaphor for the innocent delivered from their tragic fate. 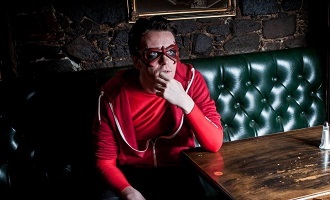 Through the eyes of writer/performer Kenny Boyle, the heroic and the mundane are already linked, opening with his diary entry of the defeat of “some guy in a leotard who claimed he was my nemesis,” before admitting that his attempt to iron his own Lycra costume was not so successful and that he’s now having to make a new one. Boyle claims his superpower is walking which is really good for the planet, and certainly he’s got the legs for the costume to prove it, but his true strength is one to which no hero will admit, his aching vulnerability and his desperately human need for connection, even if it only with an abandoned puppy. Every personal tragedy is a reason to push harder, to be the better hero. It has to be, because looking back would be to allow the fantasy to unravel. Tempered with an affectionate awareness of how ridiculous comic book convention can be (“see through call boxes – no privacy!”) and his own obsession with them, Boyle involves the audience from the start as he asks them to picture his moonlit rooftop stage set, unable to afford one having spent the whole budget for effects on buying yet more comics. Above all, respect the comics! 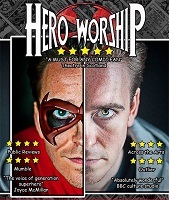 A personable rather than refined performer, Hero Worship channels the honesty of experience and is a sweet and accessible play about coping with the adversity of the everyday by making the big things small and the small things big, the hope that if you can run fast enough from the worst things that they may diminish to infinity. While it may not be possible to punch anxiety in the face or have a rooftop battle with self-doubt, there are things he can do to vanquish his enemies and he encourages the audience to join him in visualising their own personal supervillains lined up for retribution even as one of them takes care of his imaginary puppy sidekick. 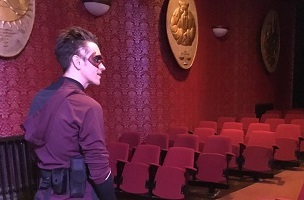 Performed in the basement theatre of Chambers Street – the only actual dedicated performance space in that building – the shields of heroes past lining the walls only serve to enhance the feeling that, for now at least, great deeds are possible, even if the greatest achievement is to keep going on and believing things will be okay.